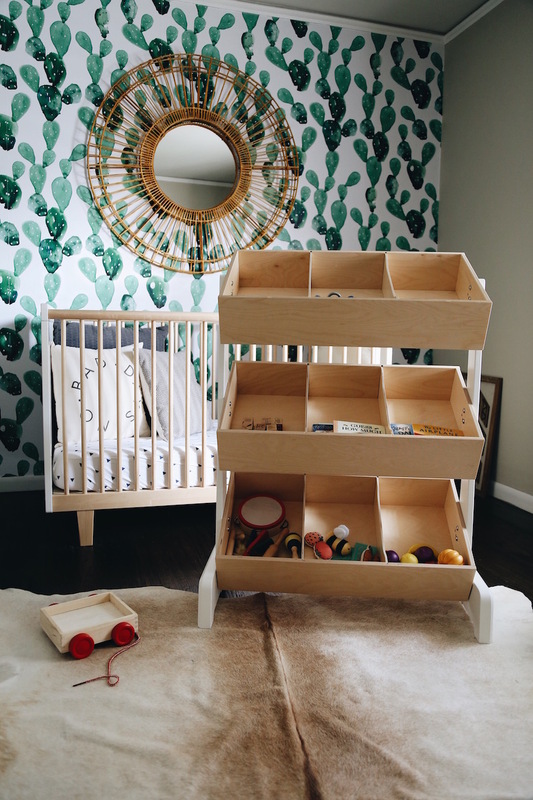 We’ve both been on a mission to get our houses organized – last week it was our bedrooms & closets, and this week we’re organizing our kids’ spaces…honestly it felt so good to throw out & donate so many toys that the kids haven’t played with in so long. We needed a good purge. Showing mommy his favorite book The Little Airplane…we read it to him almost every night! Most of his books on his shelves (same ones Brooke has!) but keep some of his favorites out because he is always reaching for them. 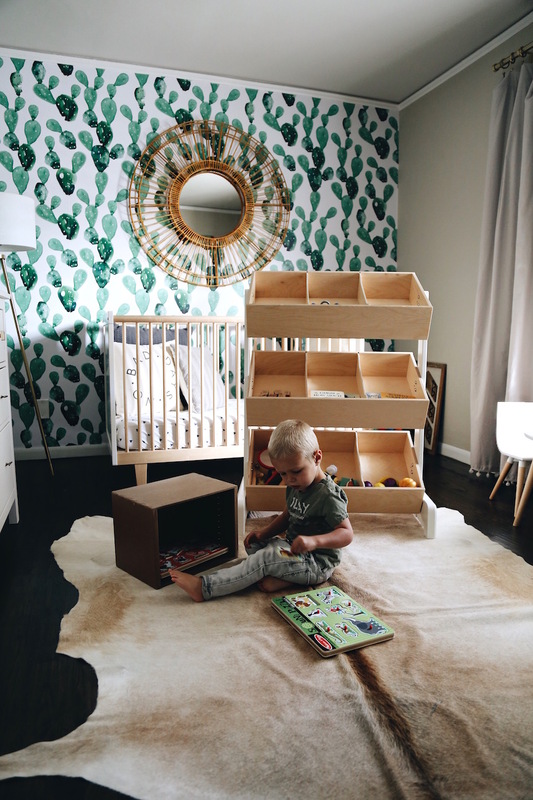 I’m planning on doing a full post on his room…just waiting on a few more things to make it complete! I’m actually only halfway done cleaning my closet – I need to go through it one more time and get rid of those “maybe” pieces (aka never going to wear it again). 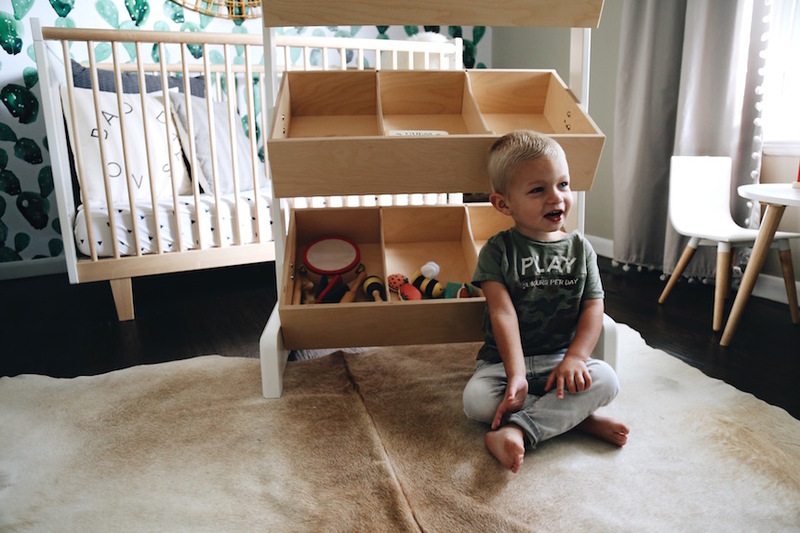 When it comes to my kids’ spaces, it’s much easier for me ;). I swear we had so many broken toys, it felt good to get rid of those and donate other toys the girls have outgrown. 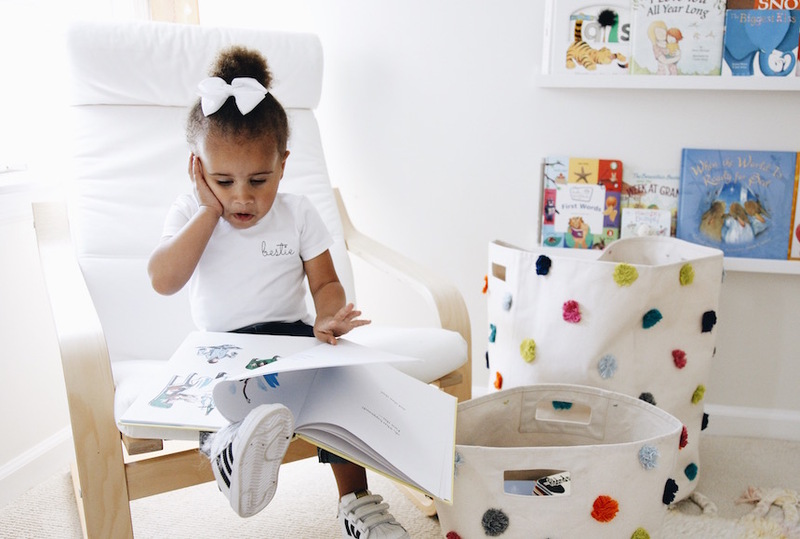 I’m fine to get rid of toys, but for some reason I never want to lose any books – they love to read, and I feel like a lot have sentimental value now. 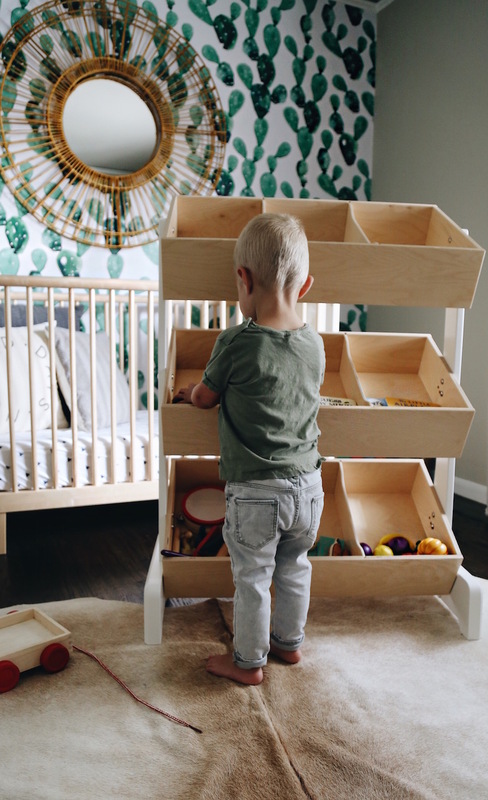 We put up these shelves in Avery’s room last year, and I finally got them organized with the help of these bins from The Tot. Before the bins arrived, the shelves were overflowing (books would randomly fall down & I was convinced we had a ghost lol – turns out we just needed to get organized), and we had books + an entire zoo of stuffed animals stacked up on the floor. This definitely looks much better and keeps her room clutter-free. 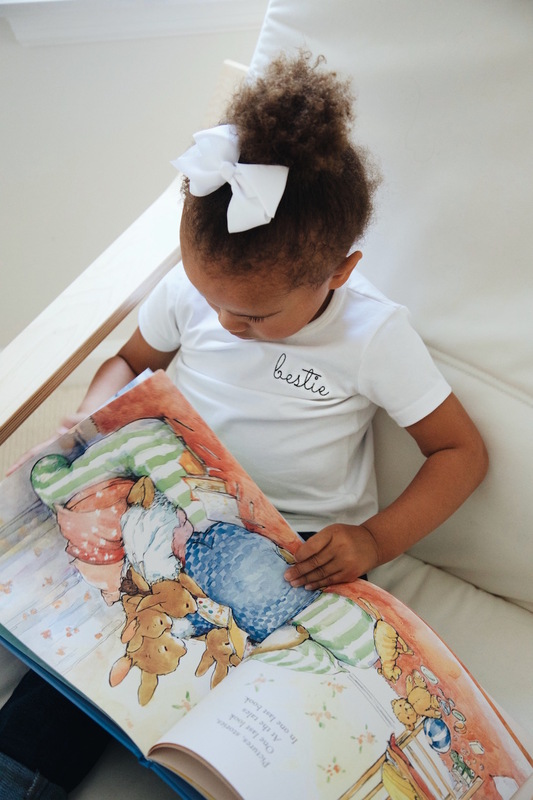 How cute is this ‘bestie’ tee? She drags this small bin all around the house with her – she carries it up and down the stairs, and dumps the whole thing out then cleans it up. 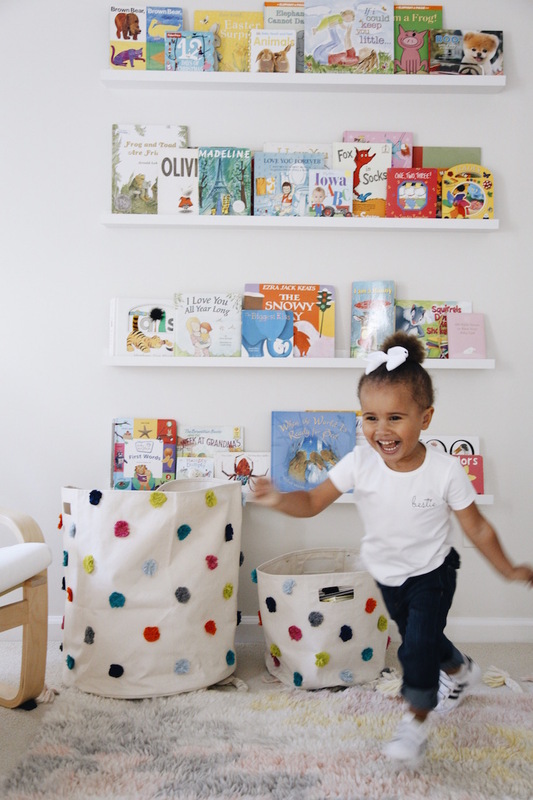 One day it’s full of toys and the next it’s full of books. She calls it her purse – ha! Love your organization tips! I was wondering if you girls save your kids clothes? As a mom of one 12 month old boy, I’m hesitant to get rid of his baby clothes or clothes that don’t fit him anymore because I’m unsure whether or not we will have more kids. It would seem like a waste to get rid of them if we had another! I just feel like everything is starting to pile up. I don’t know what to do with it all! Do you have any tips for staying practical and organized? Not trying to be annoying but are these the shelves? I really want the ones pictured. These rooms are so cute! Can you link to the book shelves? Thank you! Saw the link above! Sorry! I know this is not the point of this post // but Brooke — where are you Jeans from in the last photo! Love them! Most of these items are out of my budget too. I think it’s a good post to draw inspiration from.